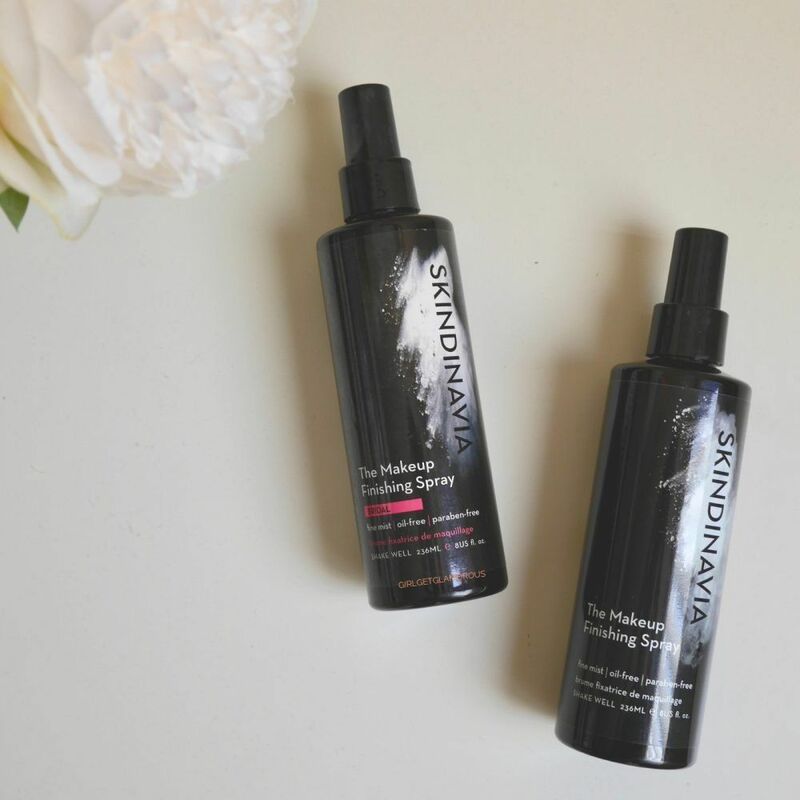 I am so excited to do this review of the Skindinavia makeup setting sprays. I’ve been using them now for years and fall more in love with them every day. They are the key to making your makeup last all day and night! Setting spray is one of those beauty products that you don’t know you need and then once you use it, you will never do makeup without it ever again. The purpose of setting spray is to keep makeup in place for an extended period of time. With it, my makeup stays in place 10-16 hours. If I forget to use it, I feel like I’ve just wasted my makeup, it fades that much faster. Also, If you saw my posts my the concealer and foundation routines for 35+ skin, you know that this setting spray is one of the key elements in keeping my makeup looking fresh and prevents it from settling in fine lines. Hello! Who wouldn’t want that? Are all setting sprays created equal? Heck no. Which is why I’ve come to love Skindinavia’s sprays so much. I’ve tried over ten brands of setting sprays and had mediocre results in terms of the product working, feeling too heavy on my skin, causing a reaction, or the packaging not spraying the product evenly. Sometimes I think it’s great to experience products that are mediocre or even bad, because they make you appreciate the great products that much more. I have honestly never used a setting spray that has even come close to the Skindinavia sprays. The closest ones are from Urban Decay and guess what…they are made by Skindinavia (the formulas are slightly different). Skindinavia’s sprays feel light on your skin. It’s a very refreshing initial mist and once it dries down, the product feels as light as air. It also makes my makeup feel lighter and fresher. I’ve never had any itching (giant pet peeve), redness, or skin reaction with Skindinavia sprays. I actually think they’ve kept my skin in better condition, because I’m not touching, blotting, or itching my skin throughout the day. I primarily use the Traditional formula, because I have dry skin. The Bridal version is great for a soft-glow focus (think flash photos), I just don’t love it in my t-zone, to be honest. The Oil-Control is incredible for oily skin. It gives a matte finish that lasts all day. In the winter, the Oil-Control version makes my dry skin feel a bit tight, but I love it in the summer. Also, if you tend to get breakouts around your jawline or hairline from makeup remnants, etc, Skindinavia’s Post Makeup Recovery Spray is amazing! I just spray a little over the irritated area and by the next day, my skin is back to normal. It has a really nice blend of zinc and copper, along with some other acne fighting ingredients. Another thing I love about these sprays is that the Skindinavia bottle has an extra fine mist. It gently covers your skin in a sheer mist that is 100% heavenly (scientific fact) to spray. It’s such a nice, luxurious feeling way to finish to doing your makeup. Also, I love that the tube inside the bottle is extra long, so that all your product eventually gets sprayed. There is zero waste, you use every last drop! Skindinavia recommends spraying in a “X” formation back and forth over your face, holding the bottle about 8-12 inches from your face. If you hold the bottle too close, you’ll get a wet spray vs a fine mist. I find that misting about 8 inches away from my face is best for me. A wet spray will disrupt your makeup, leave droplets marks and wet spots, whereas a mist will settle gently and evenly and become one with your makeup. If you read the concealer/foundation posts and watched the concealer and foundation videos, you know one of my all-time favorites setting spray tricks is to spray directly into my beautyblender then bounce that into my skin to “finish” the look of my base products. This makes them look like skin, takes away any product heaviness feeling, and sets the base products for extra-long wear. I have found that I like to spray into my blender, and then also do a generous spray of two to three “X” mists once I’m done my makeup. You can see me spray it here in this tutorial. More is better for me when it comes to setting spray. Just remember to hold the bottle at least eight inches away from your face! Skindinavia sprays are a makeup must-have for me. I can not do makeup, mine or client’s, without one of them. This is one of my few “no comparison” makeup items, because truly, nothing else compares to Skindinavia! Every Dry Shampoo I Have Ever Tried.